Shirts With Random Triangles: Former UGA QB Aaron Murray throws Tennessee head coach Jeremy Pruitt under the bus. 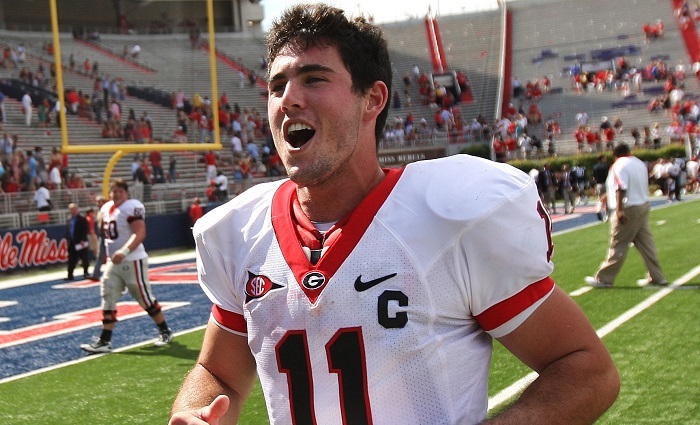 Former UGA QB Aaron Murray throws Tennessee head coach Jeremy Pruitt under the bus. Aaron Murray. Image via Gridiron Now. If throwing someone under the bus is a work of art, then Aaron Murray just used Jeremy Pruitt to paint his Mona Lisa. Well, actually, the finished piece was something more like Picasso's Guernica. Speaking to Nashville sports radio station 102.5 The Game, the former Georgia starting quarterback turned CBS Sports Network analyst (and brother of reality star Josh Murray) delivered a scathing critique of first year Tennessee head coach Jeremy Pruitt, who served as the Bulldogs defensive coordinator during the 2014 season. Murray questioned whether Pruitt had the right "personality" for a head coaching position. “I don’t know if his personality is fit to be a head coach. I don’t," Murray told the radio station. "As a head coach, there’s so many things that go into it. It’s not just going out there and coaching. You have to deal with front office. You’ve got to go talk with the president of the university. You have to deal with boosters. You have to deal with the offense, the defense. It’s not just going in there and dealing with the kids and scheming up. There’s a lot that goes into it." Murray graduated from UGA in 2013, a year before Pruitt joined the coaching staff of then-Bulldog head coach Mark Richt. That didn't stop him from giving a very bad assessment of Pruitt's relationship with his then-boss. “When he was at Georgia, the way he acted, the way he treated Coach Richt I thought was poor," Murray told 102.5 The Game. "He wasn’t as respectful as I thought a defensive coordinator should be to a head coach. That’s my thing, with authority." As for the future of the Volunteers, Murray described the team as being "far behind" the likes of fellow SEC East schools UGA, Florida, and South Carolina. Here is a link to the audio of Murray's appearance on 102.5 The Game's "Jared and the G.M." show, hosted by Jared Stillman and Floyd Reese. Pruitt is scheduled to for his first appearance as Tennessee head coach at SEC Media Days in Atlanta, Ga. on Wednesday. The chances are pretty good that Murray's comments will be brought up at some point in the day.